If only we knew what grandma's secret ingredient was in her soup recipe. There's something extremely satisfying about a hot, bubbling pot of soup on the stove on a cold winter's night. Soup makes a wonderful meal, and once you make a pot or two, you'll discover it isn't really that hard to make.Soup recipes are usually stock or broth-based, like chicken noodle soup, or they can be creamy, like creamy mushroom soup. Both take basically the same preparation. First sauté vegetables in oil or butter, stir in flour or cornstarch as a thickener (this makes a roux), then add stock or milk, and the remaining ingredients, and simmer to allow the soup to thicken and the flavors to blend. All soup recipes are based on this simple preparation, and once you make your own homemade soups, canned will never taste the same. 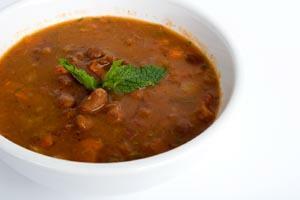 Soups can serve as a main dish when they are hearty and filled with meats and vegetables. Or, they can serve as an appetizer or first course when they are rich and satisfying. They can be elegant, or they can be homey, ethnic or traditional, but they belong in every kitchen sooner or later. Soup is a healthy, nutritious entree, side dish, or appetizer, but cooks must take care with creamed recipes. Creamed soups often have a higher fat content than traditional soups because of the dairy products used for the smooth consistency. Lower fat alternatives can help preserve the nutritional value. Because cream soup recipes lack the chunks of ingredients common to most soup recipes, they are easily digestible and suitable for many individuals with different dietary needs. Don't boil soup too much. It will lose color and flavor if overcooked. Make a double batch of your family's favorite soup recipe and freeze one batch for a quick meal when you're running low on time.